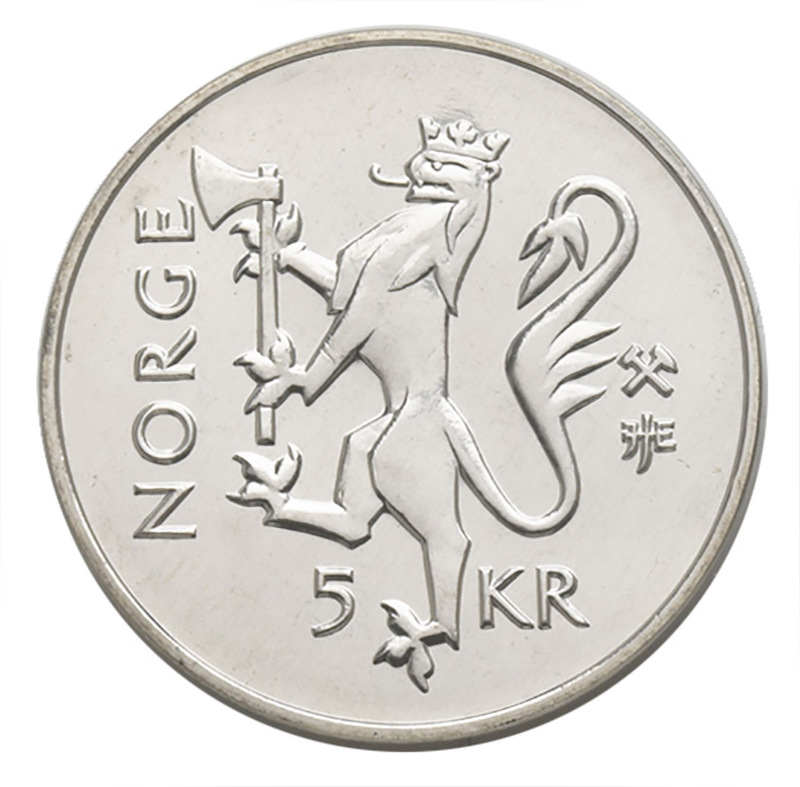 Special edition circulation coins pursuant to Section 13 of the Norges Bank Act, which is the general legal basis for issuing coins. 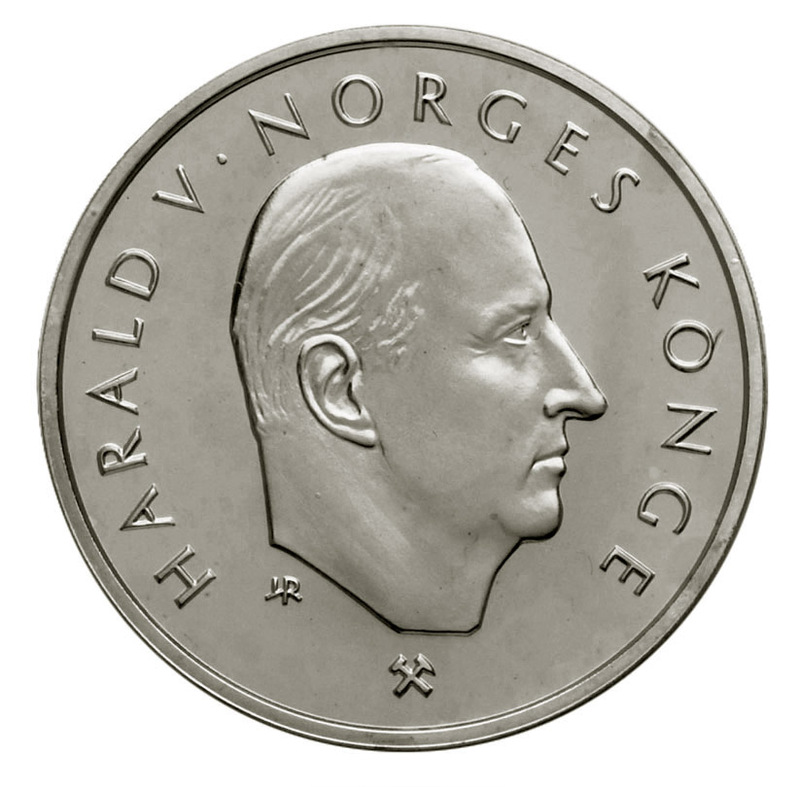 Such coins have been issued by Norges Bank on several occasions since 1975. 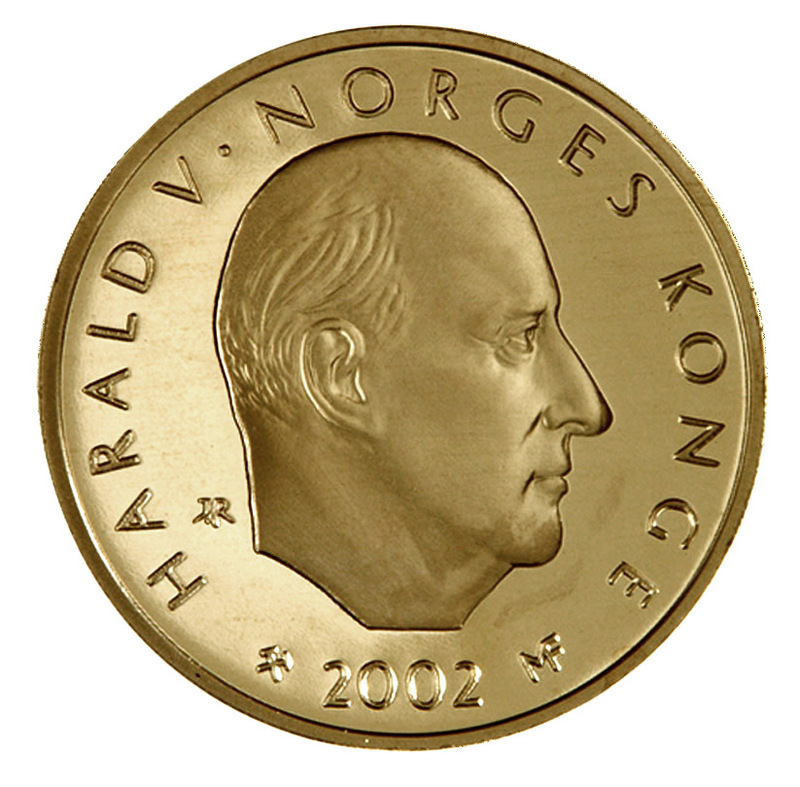 These have had identical technical specifications and the same nominal value as the equivalent ordinary circulation coin, while the design may differ on one or both sides. 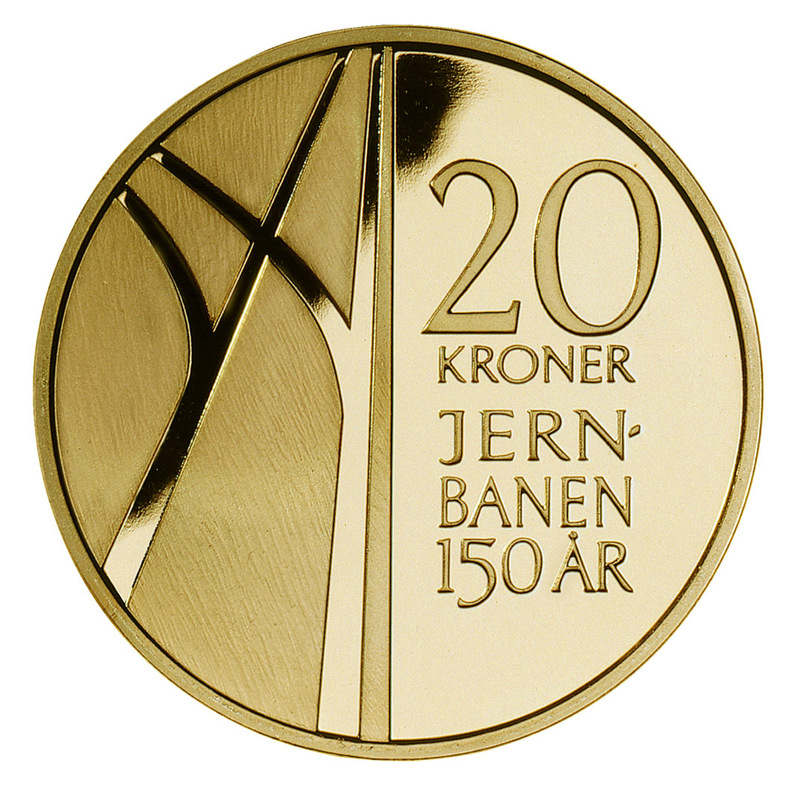 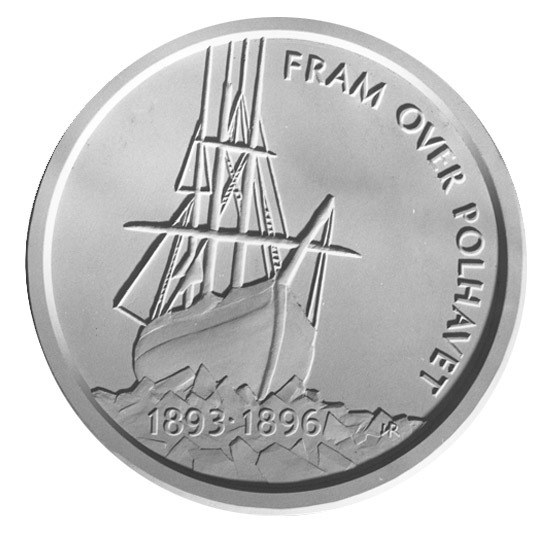 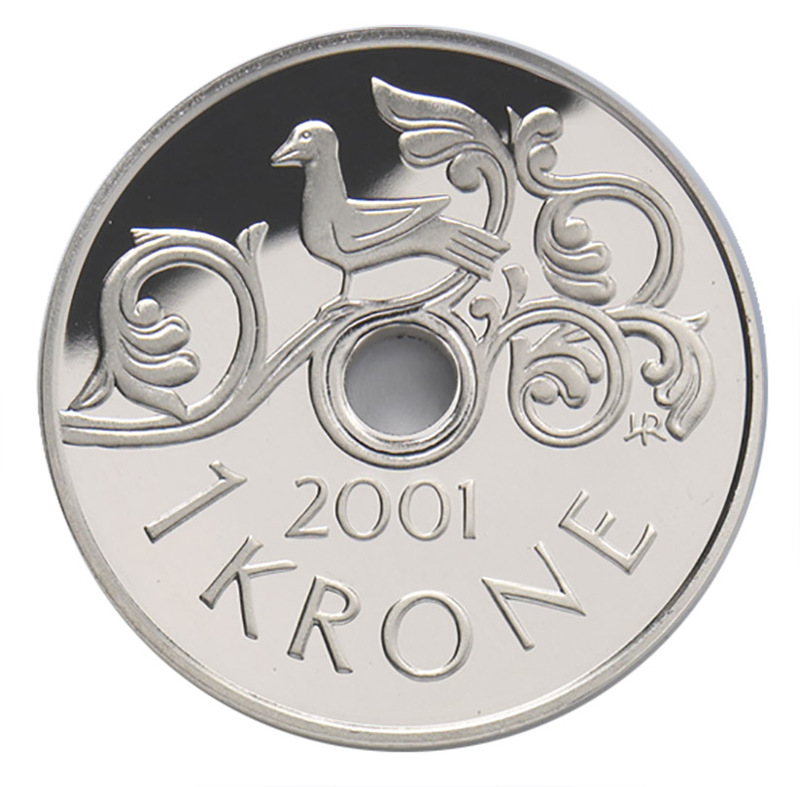 THE NORWEGIAN RAILWAY, 20-KRONE, obverse COMMEMORATIVE COIN 2004, 150th anniversary of the first railway in Norway. 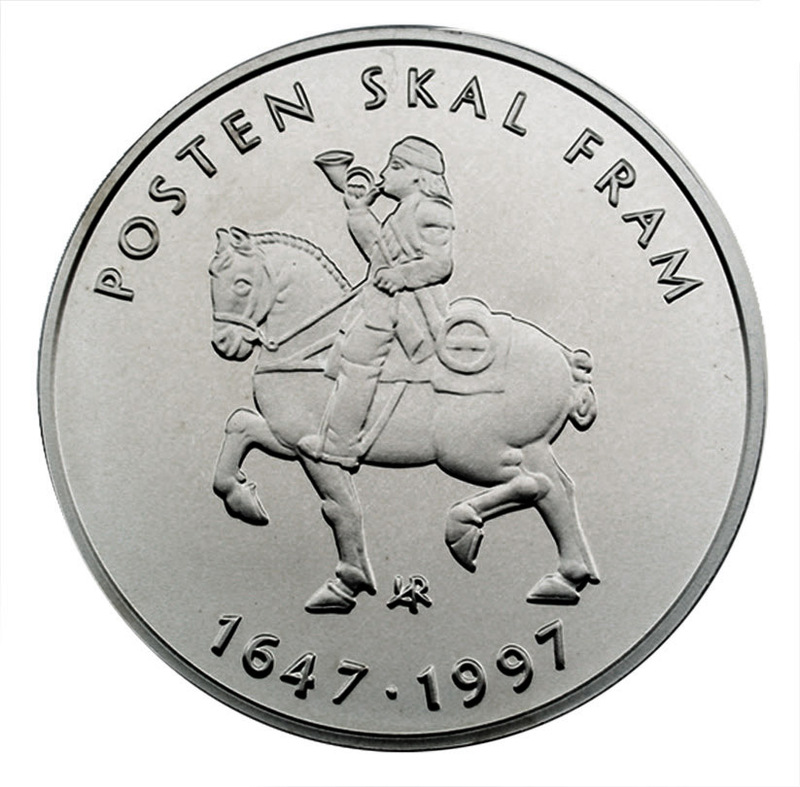 The first official train travelled on Norway's Trunk Line from Christiania to Eidsvoll in 1854. 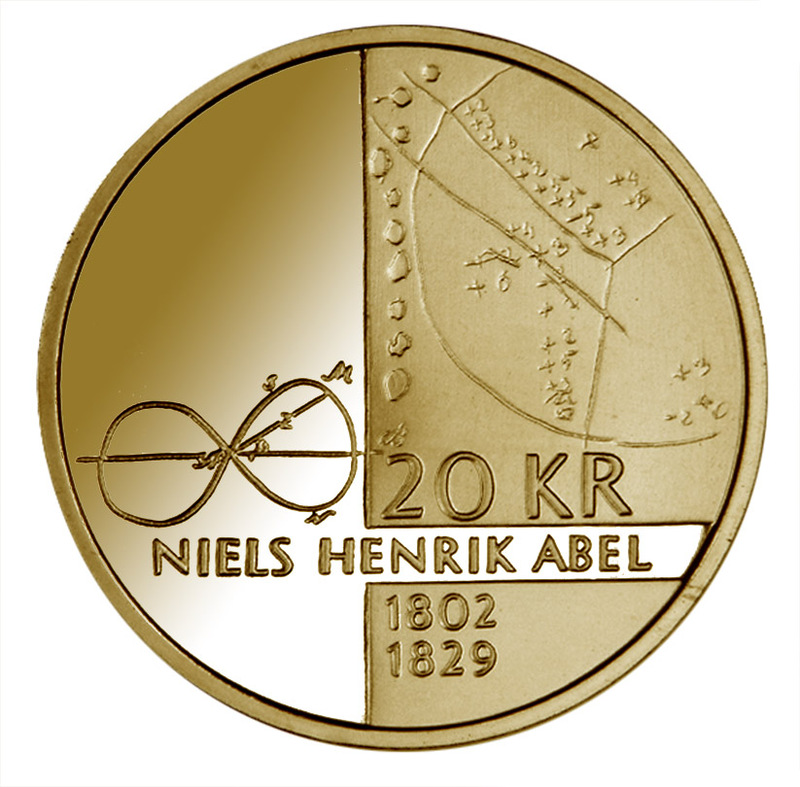 20 KR BICENTENNIAL ANNIVERSARY OF THE NORWEGIAN MATHEMATICIAN NIELS HENRIK ABEL 2002. 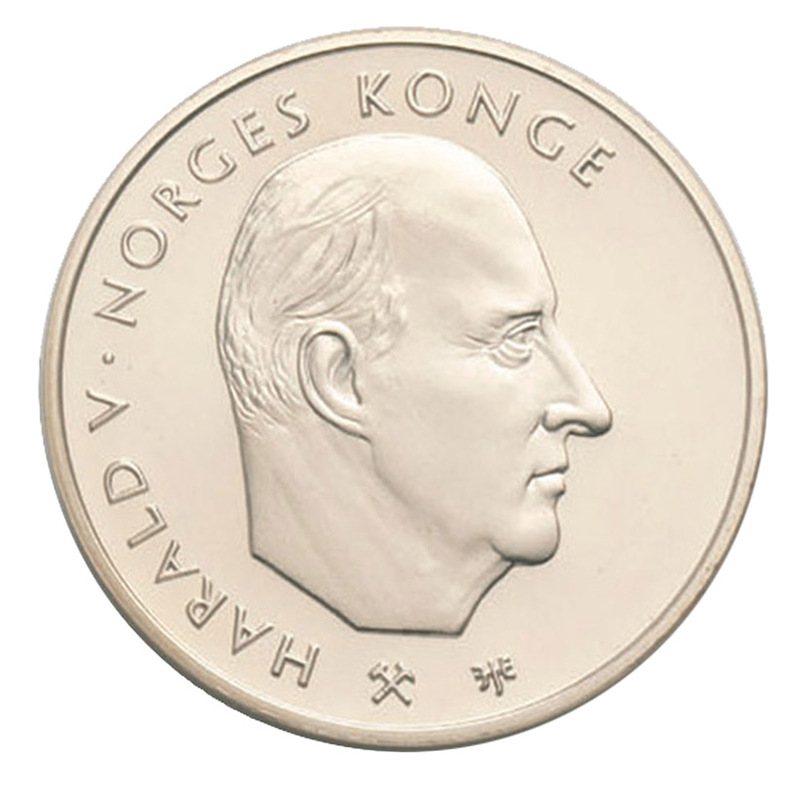 Abel wrote a fundamental work on the theory of elliptic integrals, containing the foundations of the theory of elliptic functions from where the motiv of the reverse is included. 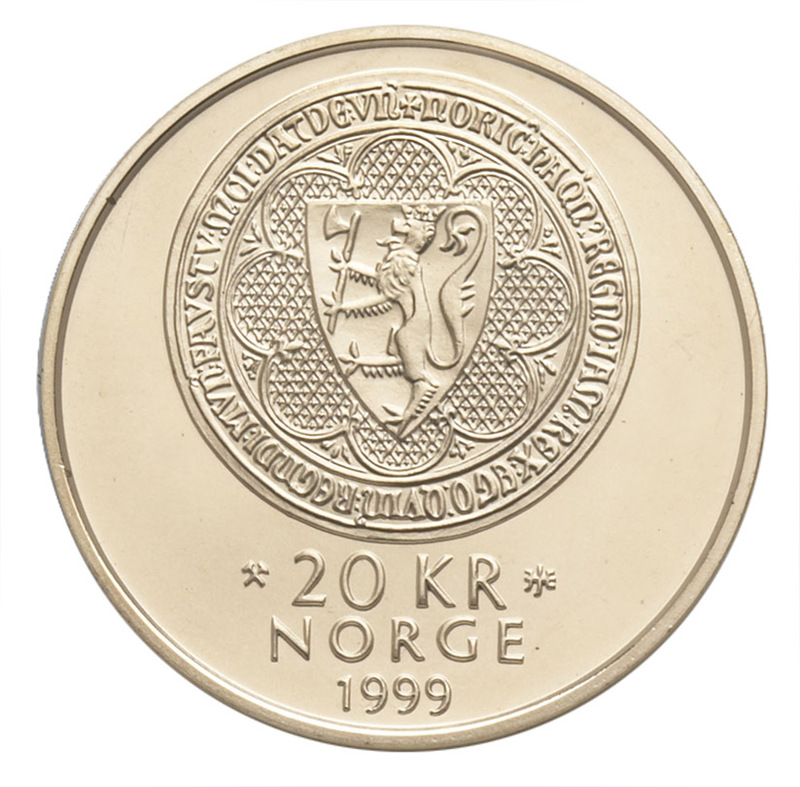 20 kr 2000 Millennium, obverse. 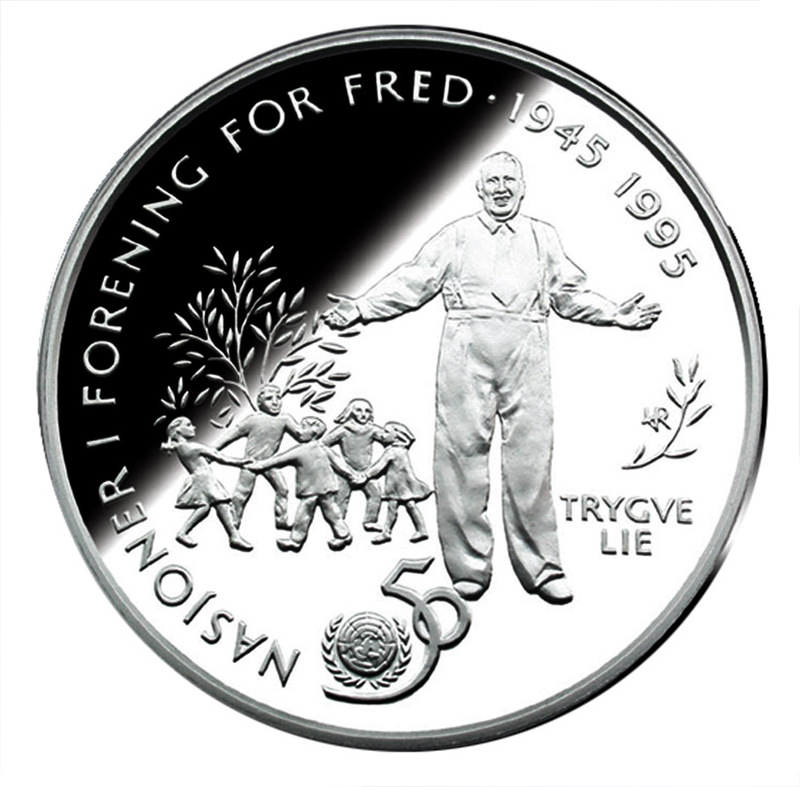 Marit Wiklund created the reverse. 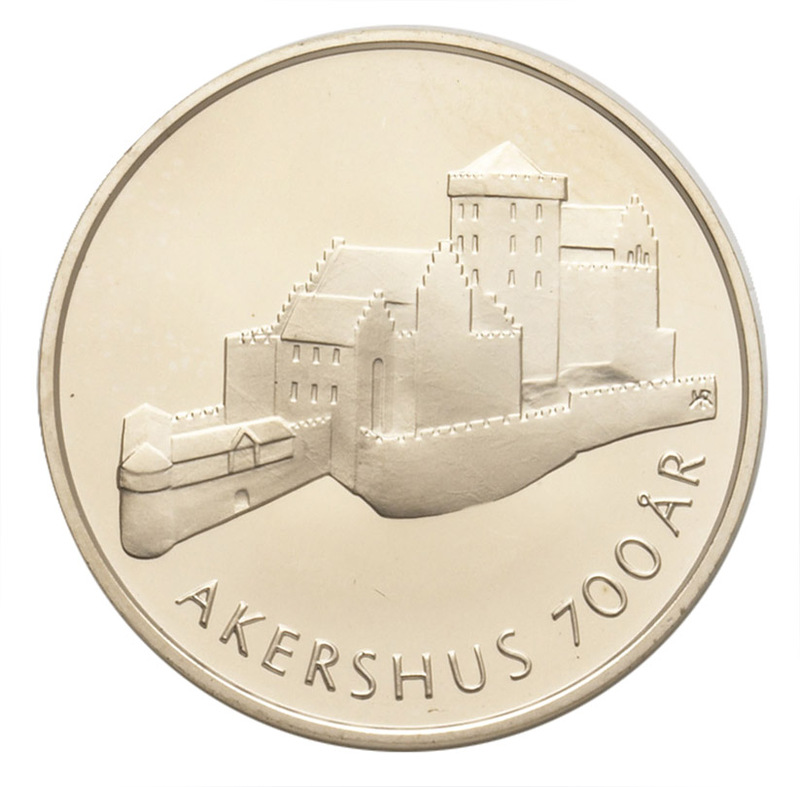 ‍20 KR, 900 YEARS ANNIVERSARY OF THE AKERSHUS CASTLE 1999. 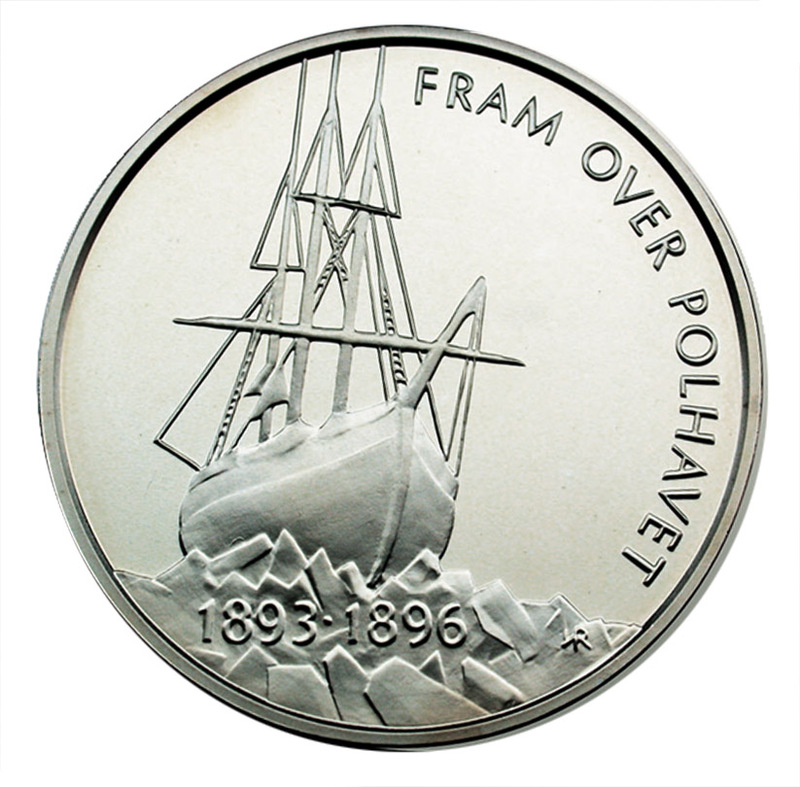 ‍To mark the Centennial anniversary of Fridtjof Nansens first expedition to the North Pole, Norges Bank issued a 5-krone special edition circulation coin in 1996. 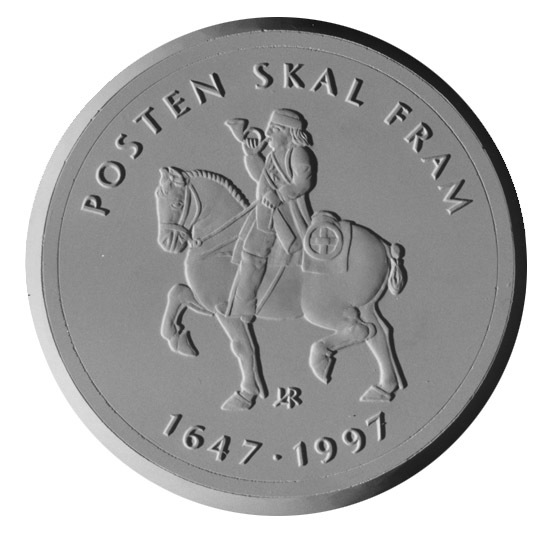 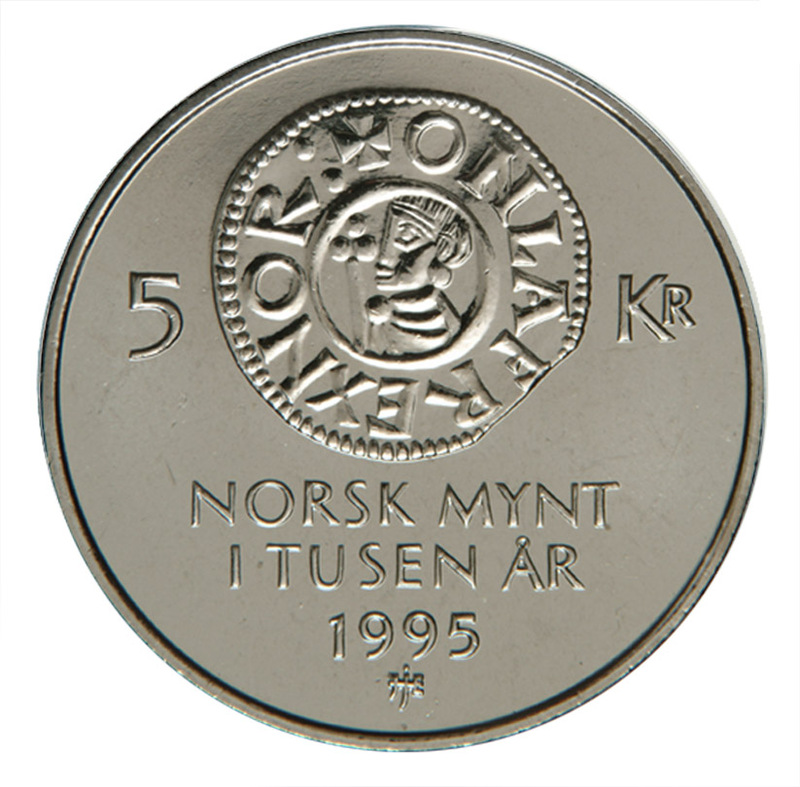 To mark the 350th anniversary of the Norwegian Post, Norges Bank issued a 5-krone special edition circulation coin in 1997. 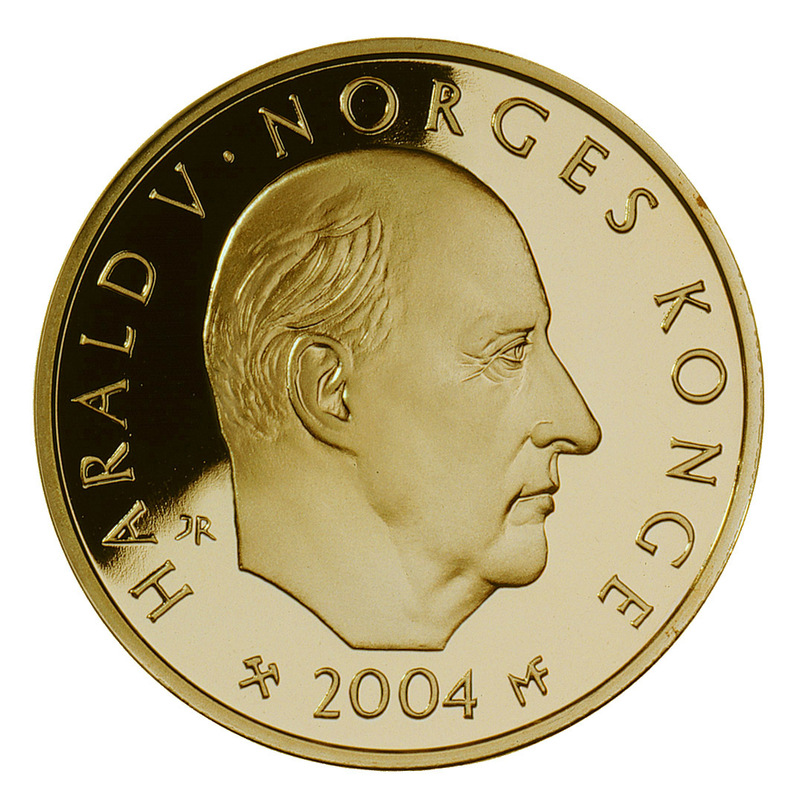 5 kr NORWEGIAN COINS 1000 YEARS, Commemorative coin, reverse. 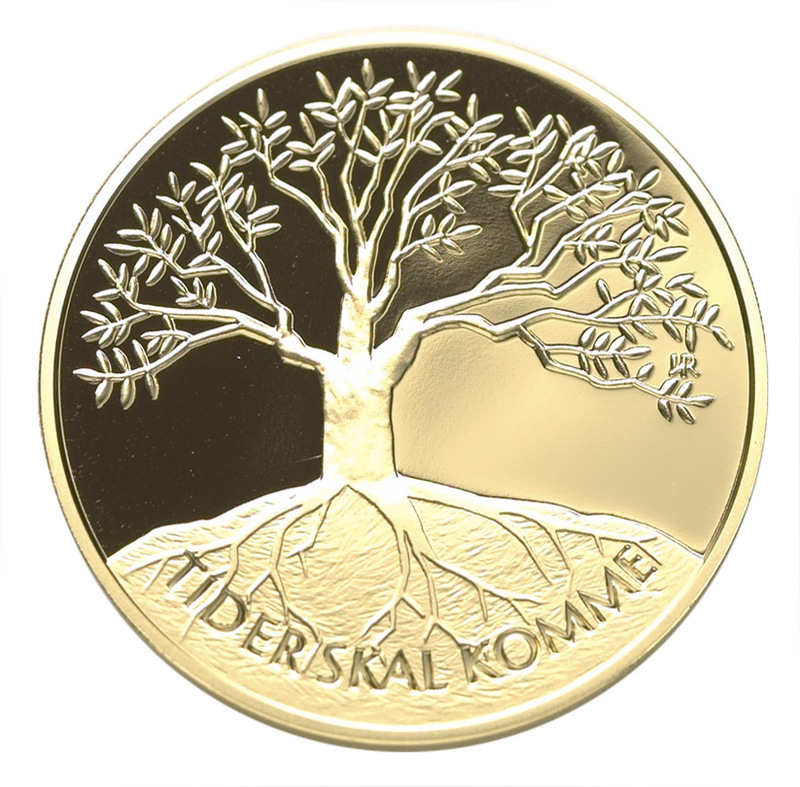 The reverse depicts the first Norwegian coin issued in 995. 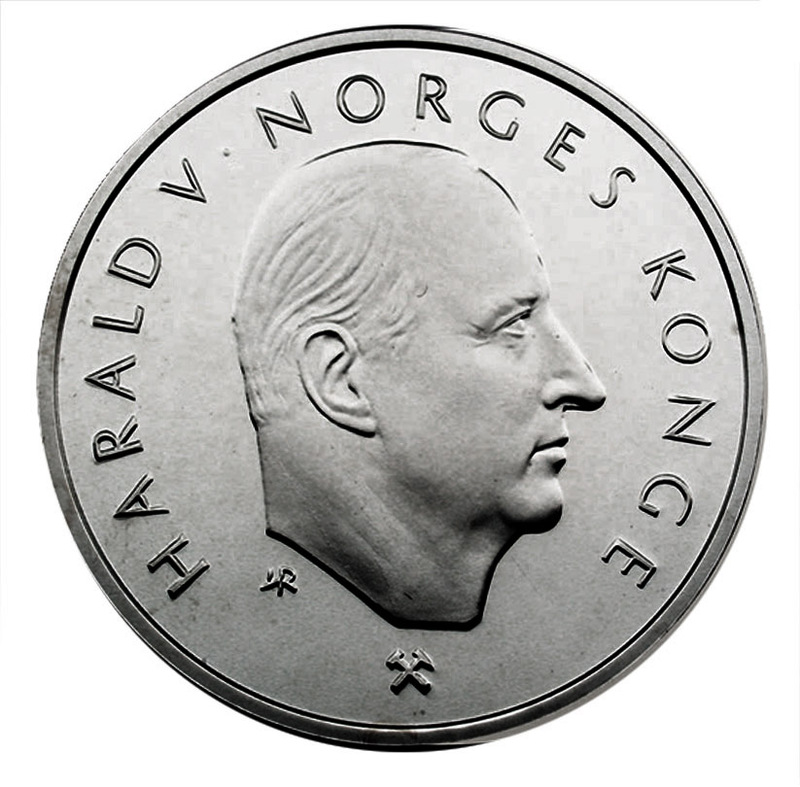 Shortly after he was made king in Norway in the summer of 995, Olav Trygvason started minting silverpennies in his own name with the edge inscription ONLAF REX NORmannorum, "Olav the king of the Norwegians". 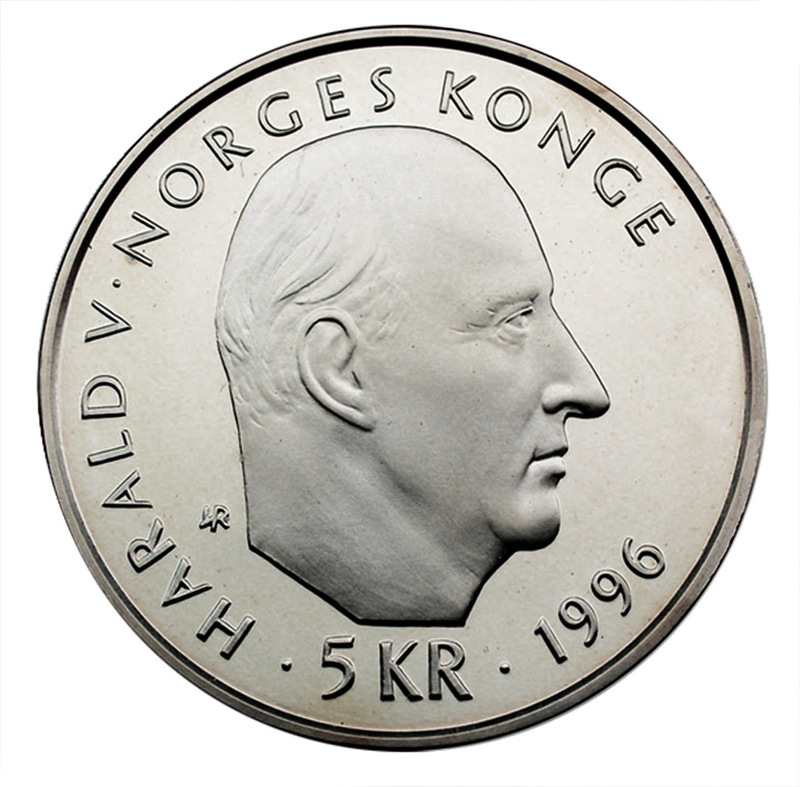 The reverse model of 5 kr and 50 kr UN-coin 1995. 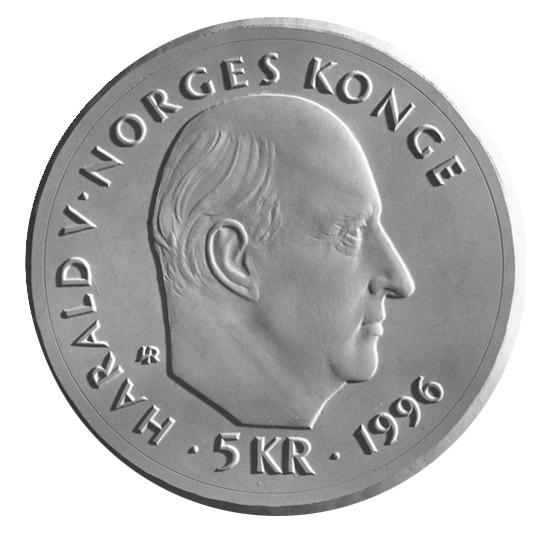 ‍The United Nations 50 years anniversary 1995 is commemorated on this 5 kr. 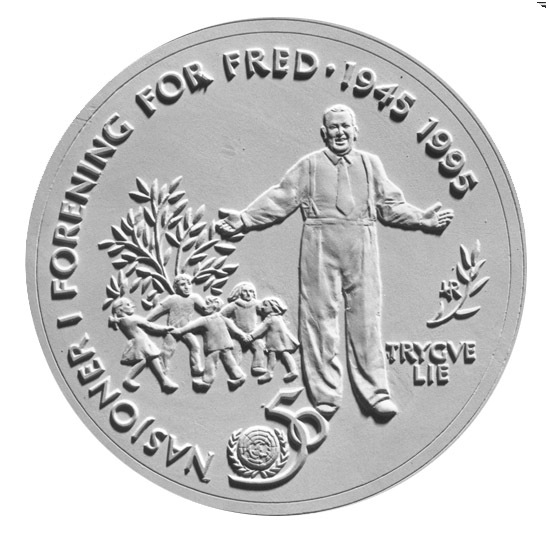 From 1946 to 1952 Trygve Lie was the first Secretary-General of the UN.